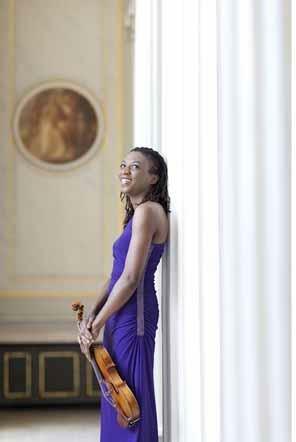 "I don't let success overshadow other important things in life"
The Afro-American violinist Tai Murray at home in Berlin. © Julia Wesely. 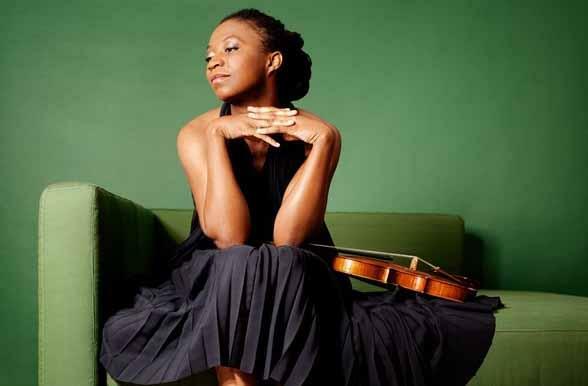 The 32-year old Afro-American violinist Tai Murray remains true to her roots and refuses to be blinded by the glamour of her musical achievements. "I love being a star, but I don't let my success overshadow other important things in life, like family or relationships. I think there is a point at which it is easy for a human being to become self-important, but that is not in my nature." "I come from an incredible family, where I was taught the importance of balance in life. I know on the one hand that I have to give something to the world but - perhaps even more importantly - that I have to learn from the world. The essence of my family is simplicity and that is what I prefer in life. My family is very proud of me, of course, but it has never over-estimated what I have achieved. Music is essential to my life, but I am aware that there are many other things in life that are absolutely more necessary." "I started begging for a violin when I was 2 years old." Tai Murray acknowledges two great sources of inspiration in her career: her grandmother, who died in 2011 and whom she always called "my mother"; and her mother, whom she calls "my mom". "I feel lucky to have had such an inspiring grandmother for a long time in my life, she died when I was 29. Like most women of her generation, she learned to play the piano as a child. And my mother also encouraged me a lot in my career. She was very musically oriented too. One of her great gifts is to recognize talents that children have. She was able, very naturally and organically, to let those talents in each of us shine. My family has been very good to me all my entire life, and of course our cultural background was important too." Tai Murray smiles as she remembers her "mom" telling her that she was already "begging for a violin" when she was only 2 years old. "I started asking for a violin very early on, and I didn't stop until I got one, which eventually I did a couple of months before my 5th birthday." 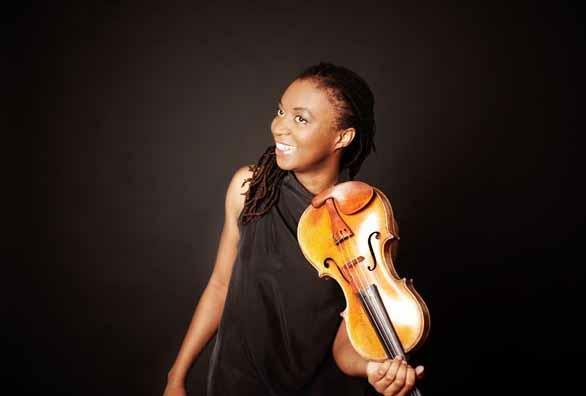 Rising star Tai Murray, who teaches violin in Berlin - her current home - as well as performing on the international stage, began her musical career as a pupil at the Sherwood Music School in Chicago, the city where she was born. She initially had two violin teachers at Sherwood, taking private lessons from Brenda Wurman and Ron Levy from the tender age of 5. "I started studying with two teachers at the same time," Tail recalls. "My mother was very good at finding teachers who were not just good but in particular knew to pass on what they knew. Unfortunately, Brenda Wurman died of a heart attack only three months after I started taking lessons with her. Of course I was very upset about that, though I was really too young to understand it. I clearly remember however, my awareness at that time of what it meant for someone I was very attached to, like Brenda, to be 'gone' from my life. I have very strong memories of studying with Brenda, and very strong memories of her as a person. It was a very formative period in my life." After that tragic event in her life, Tai continued studying with Ron Levy till she was 8. "Ron Levy was a wonderful addition to my life - in fact, you could say he actually stole part of it. We have always stayed in contact. He was the one who taught me to respect the violin - not just the piece of wood it is made of, but what it is capable of doing as an instrument. I felt attracted to the violin from an early age, but I learned that it takes more than a good feeling to be a good violinist. Of course I feel a connection with the sound, but in order to be a competent musician you must be able to make many different sounds. So you need to feel comfortable with your instrument, just like when you buy a pair of shoes you need to walk out the shop feeling that they are comfortable. That is how I feel about the violin, it's just part of what I need in life." "Yuval Yaron was the one who formed me as a violinist the most." When she was 8 Tai Murray and her family moved from Chicago to Bloomington, Indiana, where she started taking private lessons from Professor Yuval Yaron, an Isreal musician at the University of Indiana. "Most of his students were adults," Tai recalls, "and then there was me, 'this kid'. It might have seemed strange viewed from the outside, but it seemed perfectly natural to me because I was enjoying myself. He must have recognised something worth fostering in my playing. Of all my teachers, he was the one who formed me as a violinist the most. I studied with him for 6 years, from the age of 10. He was an amazing teacher, and one of the greatest violinists I have ever heard. He taught me as much about the violin as you could possibly imagine - how all the different elements work together to make it a whole. After that I studied with the Italian Professor Franco Gulli. I always saw him as 'the Gentleman of the Violin', because his personality and character were inseparable from the instrument he played with such elegance, class and total commitment to his art. I studied with him for 3 years, spending a lot of time at the Conservatory of Indiana University listening to all those amazing students and musicians playing. It was a great musical environment, I was always surrounded by music and musicians. The University of Indiana is such a good place to learn, because so many of the students it accepts are at an exceptional level. During this time, while I was still a teenager, I got private lessons at home from older students." "I started teaching myself while I was at the Juliard School of Music In New York." After graduating from Indiana University at the age of 18 and gaining her Artist Diploma from that university, Tai moved to New York where she studied under Joel Smirnoff at Julliard School of Music for 5 years (2001-2006). "Julliard was a very important period in my life and so was the time I spent with Smirnoff. He was not only an interesting teacher, but also part of the whole New York experience as far as I was concerned. The Julliard School is just like New York, there is always something happening. You can't find a more alive, constantly on-the-move-city than New York. And Julliard is a microcosm of that. It was during this period that I started the process of self-teaching. I think there is always a point at which a person realises that he has to teach himself. That happened to me while I was at Julliard. When you are a child, you absorb what other people pass on to you, but later you have to learn by yourself. And Joel Smirnoff helped me to take that step." Tai Murray's musical talents didn't remain unnoticed. Her performing career started at the age of 9, when she made her public debut on stage with the Chicago Symphony Orchestra, playing Mozart's fourth violin concerto in D, K 218. Just a little girl in a crowd of adult professional musicians. Later, at the age of 16, she performed with the Utah Symphony Orchestra, palying Lalo's Symphonie Espagnol. However, the first public performance with the Chicago Orchestra was the one that stuck in her memory. "It was fun, an exciting experience," Tai recalls. "I don't remember that much about it, though I do recall the beautiful opera house and the amazing orchestra. But the thing that really sticks in my mind is that, just before the concert, for some reason, I had to go to the eye doctor, who decided that I needed glasses. The glasses he prescribed had very thick lenses, and I had to wear them during the concert. Though they didn't influence my playing, the irony is that these glasses are the things I remember most from that concert. Afterwards I decided not to wear them anymore, I didn't really need glasses." In 2012 Tai Murray released her debut CD with the famous Six Sonatas for solo violin by Eugène Ysaÿe, which is often referred to as his magnum opus. The Belgian composer, who was only 7 when he first gave his solo-concert in front of an audience, is one of her idols, just like the Estonian Arvo Pärt. Tai Murray tries to explain exactly what the word 'idol' means to her. Just as she doesn't believe in 'blind ambition', she does not believe in 'blind idolatry'. "Ysaÿe one of my idols," she says, "but I don't idolise him. I call him one of my idols because he stands out as a great person in the world of music. I am fascinated with what he has to say. The 6 sonatas are a magnun opus of an epic proportion. They are technically demanding, but that is not why I feel so attracted to them. I love them because they have so much to say to me. I feel very connected with these pieces, in a way that is difficult to describe. The music is all that Ysaÿe needs to get his message across." A critic praised her interpretation of the sonatas of Ysaÿe, stating that "she is known for having recorded what is now considered the standard by which all other recordings of the Ysaÿe solo violin sonatas will be judged." 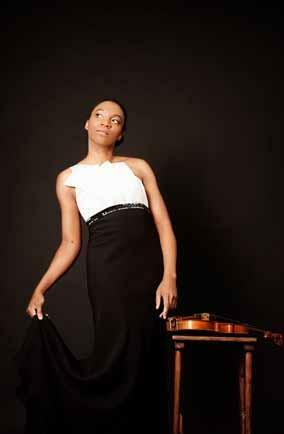 (see http://pronetoviolins.blogspot.nl/2013/06/tai-murray.html). Tai Murray tends to play down such compliments. "It's very nice to know that someone said that. But I would regard it as blind ambition to try to set myself up on such a pedestal.It's up to other people and hisotry to decide. I have to live in the moment, and that means I cannot dictate to people in the future how they will judge my work. That is not my decision to make." "The Tononi and I were very good friends." Tai Murray has great respect for her instruments, especially for the older ones. "The relation you have with a violin has to be an equal partnership. You have to be working together. I cannot impose myself on the violin, and the violin cannot impose itself on me." She had a 1690 Giovanni Tononi violin, an instrument with a history of almost 300 years, on loan for almost 4 years, and used it among other things to record the six Ysaÿe sonatas. "The Tononi and I were very good friends," she recalls. "I had a deep respect for its history. At the moment I am playing on a 1760 Tomasso Ballestrieri. Every instrument is different and obviously the older ones have developed through time. Many people have been playing on them, many important pieces, from Vivaldi up to contemporary composers. The advantage of an old instrument is that different conditions such as light and temperature have made their mark on it through the years. That means that it doesn't need tuning as much as a contemporary instrument." The only instrument that Tai Murray owns herself was made in 2007 by Mario Miralles, one of the great contemporary violin makers. "This instrument was especially built for me," Tai explains. "I don't perform on it anymore, but I do practise a lot on it at home. It would be irresponsible of me not to play on it anymore. That would be a waste of the violin's potential and a great injustice because not playing on an instrument has a big effect on it - especially when it is so young. However, I prefer to play on the Ballestrieri when I perform, because of its age. Time has had an enormous effect on a violin's ability to adapt to different circumstances. The Miralles is not so adaptable, because it is too young. It gets out of tune so often that I can hardly take it on stage: I might have to retune it every 5 minutes. It needs time to mature. I'm really sorry I won't be here to play it a 100 years from now. It will ber an exquisite piece of art by then."